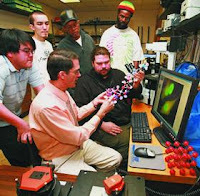 Forsyth Technical Community College, which was one of the first community colleges in the country to offer an associate's degree in nanotechnology, is expanding that program through a new system that will give its students more direct, hands-on experience building structures at the nano scale. The NanoInk NLP 2000 Desktop NanoFabrication System allows students to learn to build custom-engineered nanoscale structures with a wide variety of materials, from biomolecules to metal nanoparticles, according to an announcement from the vendor of the system, Illinois-based NanoProfessor. Forysth Tech nanotechnology program coordinator Kevin Conley said the system will allow more direct, practical learning by his students. Read more.